This guest post is from Jesus Rivera, a graduate student at Rutgers, The State University of New Jersey. I first learned about the AAS Congressional Visits Day (CVD) during the Astronomy Ambassadors program at the 2017 winter meeting. We briefly discussed science policy and it piqued my interest. As an early career scientist, I was honestly a bit clueless about how to get involved into the more "grown-up" aspects of research and its funding and thought that the CVD would be a great hands-on experience to learn about it. So I applied, got interviewed, and was overjoyed when I learned in mid-February that I was selected to represent the broader astronomy community at the Capitol. 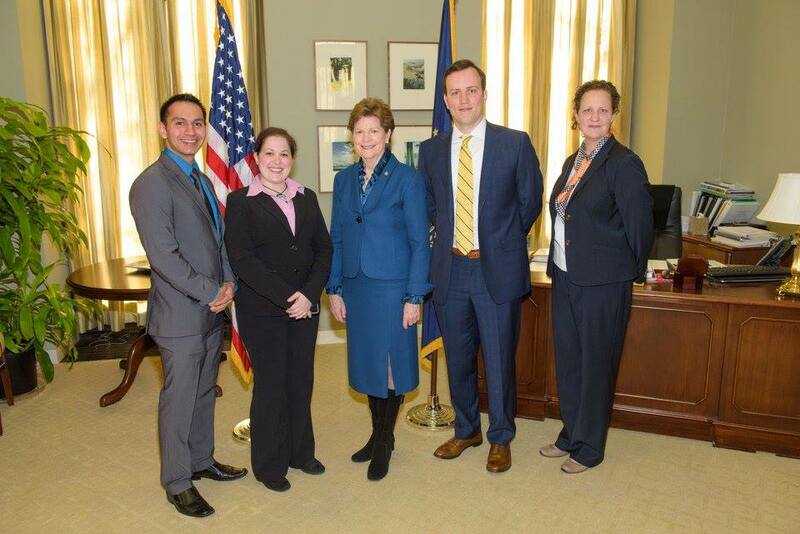 Jesus Rivera, Nicole Gugliucci, Thomas Beatty, and Jennifer Greenamoyer during their visit with Senator Jeanne Shaheen (middle). The AAS CVD took place in March 2017, but prior to that we only had a little over a month of prep time. During this period, Dr. Heather Bloemhard, the current John Bahcall Public Policy Fellow for the AAS (along with Dr. Joel Parriott, Director of Public Policy at the AAS) led two very helpful webinars: one on how to contact our senators and representatives, which I had never done; and another on the federal budget process. I never realized that getting in contact with the offices of our senators and representatives was as easy as just calling a number or sending an email. For the most part, scheduling the meetings went smoothly except for one office that was totally silent and led to worrying and panicking on my part; but a good nudge from the AAS experts prompted a last minute response and we managed to finalize a meeting time. In the end, we managed to schedule meetings with the offices of all three of my Congress members from New Jersey — Sen. Cory Booker (D-NJ), Sen. Bob Menendez (D-NJ), and Rep. Frank Pallone (D-NJ). The CVD itself was a two and half day workshop at the AAS headquarters in Washington, DC, with the first half-day being optional. I decided to participate in the optional day as I thought it would be wise to prepare myself as much as possible before I had to sit down and competently advocate for science funding to our Congress members. The astronomers that gathered for the CVD was a diverse group from across the country and all at different stages in their careers. But it was encouraging to see that we were all on equal footing when it came to the world of science policy as everyone was a relative beginner. The first day the discussions focused on communicating science ideas effectively, specifically to our Congress members. Suzanne Gurton, assistant director of NRAO, did a great job in this aspect. We reviewed some basics on handling difficult situations (mostly out-of-topic questions) that we may encounter. The second half of the day we got to meet with representatives from the National Science Foundation (NSF), NASA, and the Department of Engery (DOE). These discussions were meant to arm us with some of the more subtle but necessary details to effectively advocate for the science that we do and the funding that is needed for it. The second day was where we truly started constructing and polishing our overall message. Our big concern this year was NSF, NASA, and DOE funding as a whole as the skinny budget proposed cuts to all of these agencies. Jennifer Greenamoyer, senior government relations liaison for the American Institute of Physics (AIP), and Anna Quider, director of federal relations at Northern Illinois University, gave us great strategies on how to talk to staffers directly. It was surprising to learn that most staffers are about the same age as graduate students. As a graduate student, I am used to talking about my work with people who have been in the field much longer than I have, or people who I may consider more "expert" in the field. But when talking to staffers, I am the expert, which was an important distinction to grasp. As a big group, we worked on a leave-behind flyer on the broader AAS messages we wanted to convey to the offices. We later split up into our sub-groups — I was part of the Northeast group along with Nicole Gugliucci (NH) and Thomas Beatty (PA) — where we met with our assigned science policy guide (we were assigned the very knowledgeable Jennifer Greenamoyer) to nail down our individual pitches and improve our team dynamic. The pitch I had coming out of that session turned out to be very different than the one I had prepared going in. We were advised to try to relate on a personal level as much as possible. I ended up emphasizing how funding directly affects telescopes remaining operable and how that directly affects the research I conduct, or in simpler terms how telescopes shutting down is bad for observers trying to get data (and for graduate students trying to write their thesis!). Wednesday, March 22nd, was the big day. Since I drove to Alexandria for the AAS CVD, I ended up taking a few of us into Washington, DC, in the morning. The drive was not as bad as I thought it would be (though leaving was a completely different beast). I met up with the Northeast group in the Senate building by a big atrium. We were all a bit nervous but felt prepared. Conducting these meetings as a small group is a great system and having our two guides, Jennifer Greenamoyer and Mitch Ambrose (science policy analyst for the AIP), for the morning and afternoon meetings, respectively, really gave us that extra bit of confidence. We refined our talking points and improved our synergy after each meeting. It worked out very well that our group comprised of a professor (Nicole Gugliucci), a postdoc (Thomas Beatty), and a graduate student (myself) since I felt it was a good representative sample of the astronomy community as a whole. We gave personalized anecdotes about how the current political environment affects our own research and how it affects astronomers at each stage in their careers. I felt we made a positive impression on all the staffers and Congress members we met with. Overall the experience was very fulfilling and I learned a substantial amount about the government's role in scientific research. It prepared me for any future science policy endeavors I shall encounter. The epiphany I had during this experience was the amount of power I had as a graduate student and as a normal citizen. I’m sure many have felt the same way I did where it seems like a daunting task to get involved, but it really is as simple as making a phone call or filling out an online webform to voice your concerns. I also assumed that a "mere" graduate student’s perspective on research funding would not hold as much ground as a "professional" astronomer, but I stress to any early career scientists out there reading this — it does and we should all do our part to get involved. Our voice is unique because what we want and what we do will affect the future of the field. We are the ones who are looking for postdoctoral positions. We are the ones that are looking for permanent professorships at universities. We are the ones that are looking for jobs at national labs. Our perspective adds important points for the "why should society care?" and the fight of appropriate funding for our science — a perspective that is communicated strongest by us. And only by adding all of the individual voices within the astronomy community can the voice of the whole be made stronger.